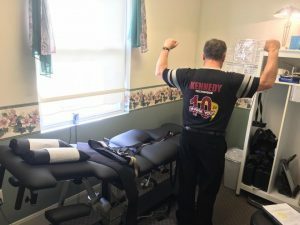 Allen Chiropractic upgrades from Chattanooga DTS to KDT Decompression System & Technique! Congratulations to Dr. Bruce Allen of Millersburg, Pa on his decompression upgrade from the first generation Chatt DTS to the state-of-the-art KDT Neural Flex! Dr. Allen loves the positioning options and comfort of prone treatments on the new system. He was amazed at how much more specific the pull felt in prone extension. 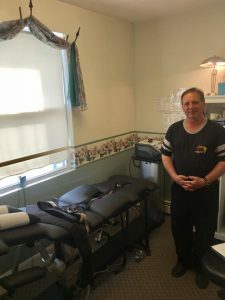 Best of wishes to Allen Chiropractic Center! Thank you for your business! https://kdtneuralflex.com/wp-content/uploads/sites/3/2014/05/kdt-logo.png 0 0 Courtney Buffy https://kdtneuralflex.com/wp-content/uploads/sites/3/2014/05/kdt-logo.png Courtney Buffy2017-03-07 14:24:242019-01-07 18:42:16Allen Chiropractic upgrades from Chattanooga DTS to KDT Decompression System & Technique!